Ansun Sujoe, 13, and Sriram Hathwar, 14, won the 2014 Scripps National Spelling Bee competition on Thursday, May 29, in National Harbor, Maryland. Both were declared co-champions after twenty two rounds of the competition which started on Tuesday. Sujoe of Fort Worth, Texas, correctly spelled the word “feuilleton”, which means part of a European newspaper and Hathwar from Painted Post, New York, spelled the word “stichomythia” meaning dialogue especially of altercation delivered by two actors. 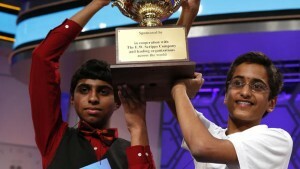 Sujoe and Hathwar become the first co-champions of the spelling Bee competition in more than 50 years. The last time the spelling bee ended in a tie was 1962, organizers said. 281 students from eight countries including the US competed for the title. “I think we both know that the competition was against the dictionary, not against each other,” Hathwar said on ESPN after the win. President Obama praised the winners as the “incredible co-champs” in a tweet. The spelling bee rules dictate that once three contestants are left, the pronouncer begins using a championship list of 25 words. If those words run out before a winner emerges, a tie is declared. Bee officials go through a yearlong process to select the words from among the roughly 470,000 in the Merriam Webster’s Third New International Dictionary. The finals were broadcast live on ESPN.